Tips For Picking Children's Sunglasses - CTS Wholesale LLC. When most parents think about their children, their number one concern is making sure they grow up safe and to that end they want to protect them as much as possible. It's not always the bigger things they need to look after either, finding and buying the right pair of children's sunglasses is a good investment in their long-term eye health. Having a few criteria handy to pick out kids sunglasses goes a long way to narrowing down your choices. Start by using some of the same criteria that you use to pick out sunglasses for yourself by remembering that younger eyes need protection from the more damaging of the sun's rays just like Mom and Dad's. Children's sunglasses need to block out both the UVA and UVB rays and you'll need to look at the tags on the products you're considering to make sure the percentages that are blocked are specifically labeled. Reading a label that only says "blocks UV rays" isn't nearly specific enough for younger eyes. Of course buying kids sunglasses has a few other requirements that you need to look at to make sure that you've got all the bases covered. Getting polycarbonate lenses is a great idea since this is the material that's more impact resistant than the more common plastic lenses. 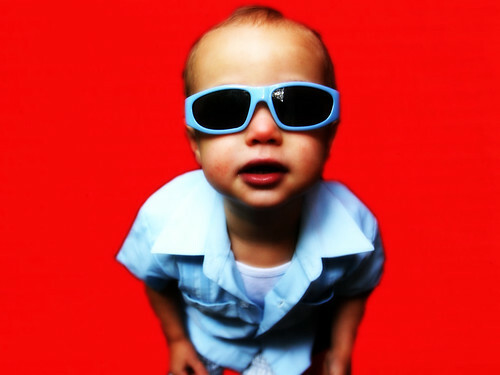 Remember too that style isn't always the first consideration when you're looking at sunglasses for your children. A large close fitting frame is best since it keeps the sun's rays from getting in at the sides and debris from causing any potential damage to the eyes. Frames that snap on impact are to be avoided as well. Flexible frames are recommended and spring hinges are a great fail-safe to cover them during play. Finally, while you don't always need to spend a lot on kids sunglasses to get a good pair that will last, there are some dangers to picking up the first pair of inexpensive sunglasses that you find. There have been reports of unacceptable levels of lead in some of the products surfacing on the market from time to time and parents need to be aware this is a possibility as well. At CTS Wholesale Sunglasses we have a huge selection of affordable and safe kids sunglasses. And don't forget to enter our contest where you could win $100 gift certificate or a fully loaded sunglass display case.